King Abdullah of Saudi Arabia accused Britain on Monday of failing to act on information the Saudis provided that might have averted London's deadly July 7, 2005, suicide bombings. Abdullah told the British Broadcasting Corp. that Britain was not doing enough in the war on terror. He made the comments in Jeddah, Saudi Arabia, hours before arriving in London for a state visit. "I believe that most countries are not taking this issue too seriously, including, unfortunately, Great Britain," he said through a translator. "We have sent information to Great Britain before the terrorist attacks in Britain, but unfortunately no action was taken and it may have been able to avert the tragedy." The king did not specify what information Saudi Arabia provided. However, the BBC reported Abdullah's remark was linked to a long-held Saudi leadership claim that it gave Britain information that might have averted the 2005 attack. Months before the July 7, 2005, attack in which four suicide bombers killed 52 people and wounded hundreds on London's transit network, Saudi Arabia told the British and U.S. governments that it had arrested a young Saudi man who confessed to raising money for a terrorist attack in crowded areas of the British capital, officials have told The Associated Press. The Saudis obtained information that the attack would involve explosives and a Syrian contact for financing, and that at least some of the four attackers would be British citizens, according to officials in several countries with direct access to the information. They spoke on condition of anonymity because the information was classified. The officials said at the time that the investigation had not connected any players from the July 2005 attacks to the original Saudi warning and that the information provided in December 2004 did not provide attackers' names, a date, specific location or time of attack. But they said the information gleaned from the suspect after he was captured returning to Saudi Arabia was detailed enough to heighten British concerns about the possibility of an attack around July 2005 in crowded sections of London, including in nightclubs. In a 2006 report, Britain's Intelligence and Security Committee, a panel of lawmakers that reports to parliament, said it had examined Saudi Arabia's claims and found "some information was passed to the (intelligence) agencies about possible terrorist planning for an attack in the U.K." The report said, "It was examined by the agencies who concluded that the plan was not credible" and there had been no relevant advance warnings about the bombings. On another topic, the king said he believes that a forthcoming Middle East peace conference in the United States will fail unless the Palestinians' needs are taken more seriously. International pressure is growing on Israel and the Palestinians to agree on a common vision of a final peace deal before a Middle East peace conference. The meeting is expected to take place in Annapolis, Md., in November or December. "We are hearing that our Palestinian brethren are not very optimistic about the progress that has been achieved thus far," the king said. "And I believe that unless a serious effort is put into this in order to reach agreements that satisfy the Palestinians, and the Arab world and the Islamic world, then I believe the conference may not be successful." 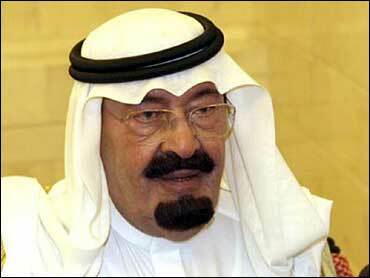 Human rights activists criticized the decision to permit Abdullah's visit - the first by a Saudi monarch in 20 years. Kate Allen, Amnesty International's British director, said Prime Minister Gordon Brown should "make absolutely clear that the extent and severity of human rights abuses in King Abdullah's country are totally unacceptable." The acting leader of Britain's opposition Liberal Democrats, Vince Cable, said he will boycott all ceremonial events during the king's four-day visit to protest the kingdom's human rights record and other issues. The king's visit will include a banquet held by Queen Elizabeth II and a meeting with David Cameron, leader of the main opposition Conservative Party. Brown's office did not say Monday whether he would raise human rights issues with the king. But it praised Saudi Arabia for recently establishing a human rights council, holding local council elections and suggesting that women may soon get the right to vote.